Memorial services are scheduled for 10 a.m. Saturday, Sept. 1, at First Baptist Church for Mae Elizabeth “Betty” Barnett Powell of Artesia. Powell, 90, passed away Saturday, Aug. 25, 2018, at her home. Betty was born Nov. 24, 1927, in Artesia, the daughter of Squire Boone and Opal Mae (Deberry) Barnett. She was a lifelong Artesia resident. On May 21, 1945, she married James T. Powell in Carlsbad. 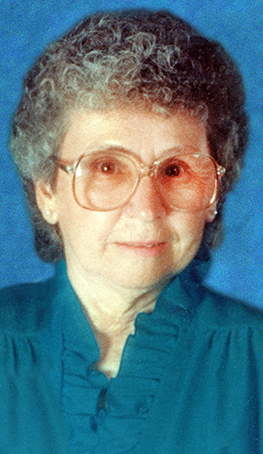 Betty was a member of First Baptist Church, where she taught Sunday School for many years. She was a homemaker and clerk for Thompson’s Clothing Store and Hub Clothiers in Artesia. Betty was a charter member of the Delta Omega Sorority Chapter in Artesia, which is part of Epsilon Sigma Alpha International. As part of the sorority, she wrapped Christmas presents in her home for more than 20 years, and as a result, more than $1 million were donated to St. Jude Children’s Research Hospital. She loved to quilt, knit and travel. Survivors include daughter Elizabeth E. “Libby” Holmes of Artesia; sons James Randal Powell of King William, Va., and Thomas Boone Powell of Artesia; sister Billie Sue Williams of Albuquerque; grandchildren Ferron Wade Powell, Sundi Gayle Powell, Van Michael Ciesielski, Thomas Boone Powell II, Andrew Squire Powell, Toni Lynne Cano, and Elizabeth Anne Holmes; and numerous great-grandchildren and great-great-grandchildren. She was preceded in death by her husband, James Powell, on Dec. 14, 1994; her parents; and a daughter, Sandra Sue Powell.